Pleasant Rich is the regional vice president of sales with Outreach IO. As the enterprise account executive for Outreach, her goal is to uncover the needs of clients within their sales workflow, develop a plan to meet their goals and objectives and ensure that the plan is executed effectively. Pleasant’s had a great experience in her career originally starting out as a teacher and then eventually moving into sales with a long list of accomplishments. 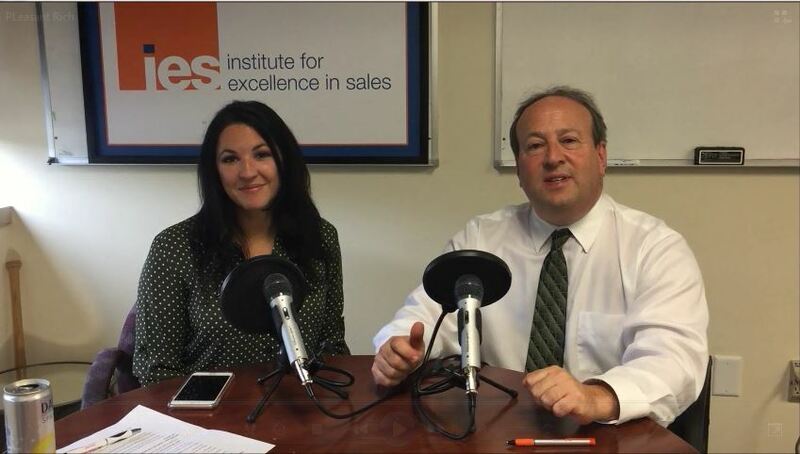 Fred Diamond: Pleasant, I’m thrilled to have you here on the Sales Game Changers podcast. Why don’t you fill in the blanks, tell us a little more about you that we need to know. Pleasant Rich: I’m incredibly humbled to be here today because as I said in my intro, 5 years ago I was a teacher. This was the most unlikely spot for me to be in, sitting here. But what I really realized and I think what people ask me about all the time is how in the world I made this jump from teaching. I’ve seen more parallels between the two careers than I think more people do. It’s been an incredible journey to learn about the selling process and to become an expert on that, but also to see how much it’s been applied from the things that I learned in the classroom as well. Fred Diamond: How did you first get into sales? How did you make that transition from teaching into sales as a career? So poked around and found a job with an education company. I was still supporting education, I was still involved in the school system, involved with kids, involved with teachers and training them and supporting them, but I was also selling and travelling and like all sales people, making a little more money, too. That was really what drove me to change out of my profession originally. Fred Diamond: Very good. You’re the regional vice-president for Outreach. Tell us a little more about Outreach, tell us specifically what you sell today and then tell us a little bit about what excites you about that. Pleasant Rich: I’m incredibly passionate about what we sell, and I think that’s the reason why we’ve grown so much. A little story to tell you what we sell: when I first got into my selling path and my selling career my biggest challenge was organization. I was that teacher that had all of the papers stacked up on the desk, I had all of the things, it was a challenge for me. Getting into my sales career I realized it was still a challenge for me. Organization, being able to keep up on top of everything, all the tasks, all the things I need to do, all the prospecting, all the pipeline management. I actually found Outreach, or it came to me through my old manager and I loved it, I fell in love with it, I realized how much it helped me, how much it solved the challenge for me. That’s really what we sell – a solution that enables sales people to be more productive. To manage their pipelines, to manage their day-to-day to make them more effective, to give more visibility within that black box of “what to do you” to get to certain results, and it has been game changing for so many organizations that it keeps us growing, it keeps people passionate, it creates addicts of the product. It’s been a phenomenal career move to go here. Fred Diamond: Tell us some of the companies you sell to. What types of companies are customers of yours at Outreach? Pleasant Rich: It’s a wide variety. We have old-school selling companies that have been doing the same thing forever and they’re very technology-hesitant and this is a brand new way of thinking to insert something into their tool stack that helps them manage their workflow, manage their pipeline outside of their CRM. We have large Fortune 500 companies, we have very small startups. We have the whole gamut, all different verticals and different channels. We work with AE’s, SDR’s, account managers, all different types of people within the organizations. Anyone that has a process that they need to follow. Fred Diamond: Who’s your primary customer, is it the CMO or the chief revenue officer or VP of sales? Pleasant Rich: That’s a great question. The VP’s of sales are typically our entry point because they are the ones that are most focused on driving that productivity and driving the revenue for their team. Sign off is usually Chief Revenue Officers but marketing also really comes into play because the sales marketing alignment’s always a conversation that you hear come up. When you give someone access to build that alignment even further then more hands want to come in the pot, so they’re always a part of the conversation, too. Fred Diamond: You mentioned in your introduction that you had been a teacher and you’ve noticed a lot of things in common with being a teacher and being in sales. What were some of the key lessons that you learned when you first made it into sales that you took back from your career as a teacher? Pleasant Rich: I will tell you one of the things that I think has made me the most successful but was the biggest thing to learn: I had to treat each person like I did a student in my classroom in the sense that I was not just looking at the classroom as a whole, I’m not just looking at the market as a whole. I’m looking at each person and understanding where their challenges lie, where their gaps are, where I need to adjust my conversation level and adjust my level of education to them to get them to where they need to be, and some are further along than others. I would have a classroom that was filled with gifted kids and special needs kids and people that were on level and so it was totally differentiated with the way that I approached every student. That’s how I approach every conversation that I have now, and while it’s easy to fall into a pattern and the same script and the same demos and the same discoveries, it’s really easy for us to fall into those patters of sales professionals. It’s really important to make sure that we’re differentiating based on who we’re talking to and making sure that we’re adjusting specific needs. That comes, of course, with great discovery. That comes with understanding the market, understanding the vertical that you’re in and really being able to identify what the challenge is that your customer is having. Fred Diamond: Tell us a little more about your specific area of brilliance. Pleasant Rich: Mine is definitely being able to diagnose challenges and problems and situations. I’ve seen that in my sales career when it comes to working with specific clients but I also see it now with the teams that I manage. Being able to really listen and to hone in on the pieces that I know can be changed, modified or tweaked, and I think that that’s a really important key characteristic because especially for sellers that are top, you look at your top performers that often times are doing really well, you can always diagnose something and identify an area of weakness that you can support, change and optimize. That’s going to make you even more successful. That’s really where I’ve been able to hone in my skills, is talking with customers, identifying with their needs, even with ones that I’m building relationships with to continue to add value by understanding where they’re at by supporting them and growing even further. Fred Diamond: Based on your background as a teacher and how you talked about customizing or focusing on the individual, how you approach each individual, do you find people are responsive to that? Do you find that your customers are willing to interact with you that way? Fred Diamond: Based on your teaching background I’m sure you’ve had many people who’ve helped you along the way. Tell us about an impactful sales career mentor and how they impacted your career. Pleasant Rich: I’ve had the privilege of having two people that I think have been probably the most influential in my career path. The first one is my VP of sales, his name is Mark Kosoglow and he’s actually the one that hired me straight from teaching without any selling background to link to my name. He’s a super competitive person and he always wants to hire top people and he wants to be the top, which is one of the things I love about him, but he hired me straight out of the classroom. He’s invested so much time into supporting me and growing me as a professional, providing opportunities which I think is a really key thing for a leader to do, is actually provide your team with opportunities to grow, to expand their area of expertise, because we’re very focused on protecting sales time which is obviously key because that’s what our revenue’s tied to. But opening up those doors of opportunity to experience different things outside of a person’s sales role is going to grow them as an individual. The second person that I really attribute a lot of my success to is a man named Stan Hansen and he has been phenomenal. He comes from a lot of companies that we worked for, he’s led huge numbers of sales teams and grown and been super successful. Stan was now at Outreach – he doesn’t work for Outreach but when I was first starting in Outreach he was my first big client that I pulled on, over a hundred seats. I remember our first conversation, I was super nervous but he was so upfront with my in the type of person he was and we built a relationship throughout this long deal cycle. Fred Diamond: That’s great, having two mentors. Curiously you mentioned your team. Do you provide mentoring to your team? Do you feel of yourself as being a coach or a mentor to your people? And so that’s what I like to do. Everyone gets a week. Once a week we touch base, we talk about discoveries, because especially in our industry everything’s changing all the time and so we’re constantly evolving, constantly moving forward and as things grow needs change, new products come out, we’re addressing the market a little bit differently, so coaching is always a valuable part of a conversation. Fred Diamond: What are the two biggest challenges you faced today as a sales leader? What are two of the challenges that you deal with either facing customers or internally? Pleasant Rich: There are a couple of things, so I think the first thing is the – especially the industry that I’m in. I think that there’s a challenge with the way that buyers buy, so when you have a conversation with someone that’s in a SaaS company, out in San Francisco or Seattle that’s just inundated with technology companies, tool stacks, tool technology, they buy these things every single day and so that’s not a challenge. But where we’re really trying to go and get into more of the greenfield area, it’s a new experience for a lot of people. So being able to coach them through the buying process especially when it’s not a light item thing in their budget, it’s not a CRM tool, it’s something that we’re creating a space in. I think it’s a unique time that we’re in because we’re creating that space, but that still is a challenge, helping buyers to understand the process and being able to help my team, coach them through that as well. I think that’s one. The second thing is that it’s always about competition, right? So competition and market saturation and buyer education. We face a lot of that as well, really educating buyers in what we are, what space we address. I think you have to be really clear cut in your vision and your value propositions which some companies are really good at, some have a real big challenge of honing it in and tailoring it to be very direct specifics so that way it’s easy for your buyers to understand what you are, what space you fill and so that you’re not being compared to other parts of the market. Fred Diamond: Pleasant, what is the number one specific sale success or win from your career that you’re most proud of? Pleasant, take us back to that moment. And so I remember standing in that “boot” and hearing that excitement and the win and knowing that the hard work had paid off, the company was the right company and what we were doing mattered. Fred Diamond: Pleasant Rich, was there ever a moment where you thought to yourself, “It’s just too hard, it’s just not for me”? Pleasant Rich: [Laughs] I will tell you I have that thought once a month and it’s always the last day of the month because we go on monthly quotas. I hate the last day of the month, every single month, because it is so stressful. We are so competitive, we are always charging after big lofty goals, I am not a loser at all so I don’t lose on my quotas so that was never an option for me. Every last day of the month was always a stressful day in thinking, “Oh my gosh, if I was just out of sales I wouldn’t have to deal with this.” But then the first day of the month comes and we hit our goal and I’m like, “Oh, I love sales!” [Laughs] so every last day of the month I have that thought process because you are creating revenue for a company which is supporting hundreds of people, right? That’s your job. If you fail and the rest of your team fails then you’re hurting the company and you’re hurting the livelihoods of other people so it’s a big deal to me, that last day with end of quota. Fred Diamond: You take the responsibility on the company and that’s the role of sales. Nothing happens until something gets sold, the last person out the door is the sales person, the lights are on because something was sold. That’s a great story, there. Pleasant, what is the most important thing you want to get across to junior sales professionals to help them take their career to the next level? Pleasant Rich: I would say that the biggest thing they can remember is that your relationships are directly tied to your wallet. Everyone wants to impact their wallet and I’ve met a lot of lone wolves that are out there killing it every single day, but your relationship skills inside your company and outside your company are directly tied to your wallet. I will tell you, there’s things that I see and certain patters. There are sales people that will make the sale, move on and they’re good to go, they move onto the next sale. That’s not good relationship building. I’ve always made it a point in my career to make sure I maintain and show a level of appreciation to my customers whether I’ve passed them off to a CSM person or an account manager because those people become your champions. And one of the biggest things that you can do for yourself is grow a referral network, and the way you do that is by staying in touch and making sure that even if there are challenges – we don’t like to handle conflicts a lot when we’re done with the sale – but if there are challenges showing that they have a champion inside your organization to make sure that things get handled. I would also say relationships with inside your organization are so keen important. I make it a point to talk with the CSM’s, to talk with our solutions consultants, to make sure that my relationships within the company are not just based on when I have a problem and I need something fixed but that I’m building this because we’re a team and we are partner within this organization. That’s a key thing because people want to help out their teammates, they don’t want to fix the problems of the sales people all the time, so if you can build your relationships on the internal level and make sure you maintain that and then make sure that with the relationship with your clients – even ones that don’t become your clients – to show that you’re still going to provide them value outside of getting the contract signed, that’s going to be one of your biggest wins. Fred Diamond: What are some of the things you do to sharpen your saw? We look at – specifically from my industry – our success managers, they work with our companies all the time who are building out processes, they’re building out playbooks. They’re a great resource to talk shop, “What are you guys seeing that other companies are doing that are successful?” Because then that’s going to help me as a sales professional and it’s going to give me knowledge to be able to pass along to other people that I’m talking to. I think talk shop is a huge piece to growth and sharpening your saw with all varieties of people. Pleasant Rich: I want to solve a problem. I want to solve pipeline problems. [Laughs] because I think that’s one of the things that we see all the time. There’s a challenge of people having lots of opportunities, are they managing those effectively, how effective are they doing it, what are best practices outside of setting meetings, things like that, being able to scale. Within our own organization that’s the challenge that we’re solving. Using our product, using some best practices, but I want to be able to make it to where an AE can step in and have the playbook that’s going to enable them to be successful from start to finish whether it’s at the initial demo start to sending out the contract, what are the best practices to get these things closed. That’s a challenge that I see because sales people are pretty disorganized, most of them are. A lot of them are really good at it, depends on the level of your sales person but I want to be able to help and give a playbook to people that are coming into the industry, be able to scale those best practices for being successful. Fred Diamond: Pleasant, sales is hard. People don’t return your calls or your emails. Why have you continued? What is it about sales as a career that keeps you going? Pleasant Rich: You have got to believe in what you sell to stay in this profession and to love it, and to not become complacent. There are people all across sales organizations that are doing what’s necessary, take it the pay checks and we all know those kinds of sellers. But in order to really love it, you have to believe it and you have to really love your job. You have to love your company, you love what you sell. What keeps me going is when I actually have a problem to solve. I think that’s what I loved about the classroom, was the fulfillment in the relationships that I built. I still walk around, it’s been years since I taught, but now the kids that I used to teach are all adults and it makes me feel terribly old but you have to find fulfillment in that. I get really excited when I know that we’re driving market change, when we’re driving value for our customers, when we’re solving problems because I myself experience those things, problems as a seller. I get it really fulfilled when I’ve built a relationship with someone that they trust me not as a sales person but as a partner with them. When you achieve that partner status with a person that’s a fulfilling piece. That’s what keeps me going about sales, I think as long as I’m keeping myself in a place where I believe in the company, I believe in what I’m selling and I enjoy the relationships and the partnerships I have then I’m going to be driving to continue to go on this path. Fred Diamond: Give us one final thought. Give us one final idea for the Sales Game Changers listening today to help them be inspired. Pleasant Rich: Sales needs diversity. That’s what we need, we need diversity and the diversity that we need is pulling from the experiences that everyone has that are different from everybody else. Because if we have a bunch of sales people that are all focused on the same things and do the same techniques and the same types of scripts, and the same types of processes then people are going to get bored. Our customers are going to get bored, sales is going to become even harder. And so each person has a unique background. We do have a lot of sales people that come from different careers that are switching over, and while the career might be completely different the skill set that you have can very easily be applied to sales. I think that that’s the key thing, understand what your diversity is, understand what makes you unique from all of the other people in your organization and enhancing those and amplifying those in your sales cycle, in your conversations, to bring more value to someone that doesn’t have that type of diversity within them.